A protest at Charlottetown’s province house that included symbolic gifts of hemlocks trees turned nasty for MLAs on Friday. The demonstration was designed to be a statement about the realignment of the Trans-Canada Highway between Bonshaw and New Haven. The protesters say the new highway is unnecessary and harmful to the environment. They are particularly concerned about the fate of a number of hemlock trees in the path of the highway that are estimated to be 200 years old. The government says the highway needs to be straightened out for safety reasons. 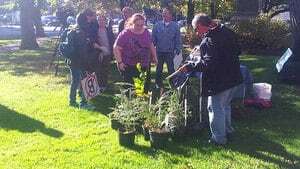 The protesters presented hemlock saplings to Liberal MLAs as they came out of a caucus meeting. Some of the MLAs stayed to listen to the presentations. Marie Knockwood told the people gathered she would put herself in front of the trees to stop the work. Liberal MLA Bush Dumville said he would dedicate his tree to his daughter. He described how she flipped her car on that section of highway, and if there had been oncoming traffic she would have died. People started booing him, saying project was not about safety. Knockwood took the hemlock away from Dumville saying he didn’t deserve it. Dumville walked away in disgust, and was joined by Transportation Minister Rob Vessey. Vessey said he didn’t hear anything to change his mind about the project, and it would be going ahead.